Bali is a beautiful Indonesian island surrounded by the Indian Ocean, known for its spell bounding natural beauty and rich heritage, be it white sand beaches, coral reefs or ancient temples, this island seems to have it all. The airport itself gives one the impression that one has travelled to a different world, characterized by statues and paintings boasting of Bali’s architectural and cultural heritage. One can spend months touring this island and yet remain hungry for more; however I shall talk about the few major destinations which we visited during our short tour of this scenic island. A visit to Bali is definitely incomplete without a visit to Kintamani village, located on the banks of the Batur Lake offering panoramic views of Mount Batur, an active volcano which has been causing havoc since 1968. The region around the volcano is marked by arid black soil which is actually lava which has gradually dried and integrated into the soil. We lunched at a charming restaurant with massive glass windows offering scenic views of the volcano while we munched on deep fried banana coated with sticky black sauce. Enthusiastic tourists can trek closer to the volcano for better views, however we satisfied ourselves with a view photographs from the nearby view point. The next destination on our itinerary was Tampak Siring, a holy spring water temple, according to Hindu mythology the water from the seven taps at this temple comes from the seven great rivers i.e. Yamuna, Ganga, Kaveri, Sarasvati, Narmada, Kshipra, Godavari and purifies people of all the sins they have committed in their present and previous lives. Apart from the history the temple itself is a beautiful sight, with intricate Hindu sculptures and a distinct holy vibe. Inside the temple there are ponds with water flowing into them from ancient stone taps, these ponds are frequented by both locals and tourists who bathe in them hoping to purify themselves. We then visited Goa Gajah or Elephant Cave, a UNESCO World Heritage Site; it is characterized by intricate sculptures carved on rock. Inside Goa Gajah one can find a bathing temple with water gushing out from ‘demons’ carved into the rock into shallow ponds, and the Elephant Cave itself. The entrance to the cave is marked by intricate carvings and a giant figurehead which was initially mistaken to be an elephant, hence the name ‘Elephant Cave’, the carvings make on wonder about the architectural prowess of the people of that time. The last destination on our itinerary was Uluwatu Temple, located in the Bukit Peninsula, this temple is also known as the ‘cliff-hanging’ temple as it is located on the edge of a cliff surrounded by pristine blue waters offering panoramic views of the Indian Ocean. Truth be told the walk to the temple is exponentially better than the temple itself, picture a series of stairs going up a cliff overlooking the sea with waves crashing all around; the image is a heavenly one and a delight for every photographer. The island of Bali is known by many names be it ‘Paradise Island’ or the ‘Island of God’ and it certainly befits all of them. A visit to Bali is one which no travel enthusiast can forget, every scene, every location, is imprinted in one’s mind like a picture postcard; vivid and full of beauty. In my opinion Bali is probably one of the best travel destinations in the world and a visit to this island should definitely top every traveller’s ‘to do’ list. Sometimes maybe all you need is a weekend getaway with your friends to some place that you’ve never even heard of. Just to free yourself from the shackles of everyday strains, hindrances and so on. For me, and most of my fellow writers, those shackles were restraining us for almost a month or more. Yes, our 12th boards were in progress and trust me that unforgettable Tuesday on which it ended was the beginning of days of eternal bliss and peace. Well, not exactly. But yeah, I was dying to leave for this place on the upcoming Thursday. Oh, the place. So it’s a small town, called Wai in Maharashtra. Most of us must have heard of the evergreen Mahabaleshwar in Maharashtra (Who hasn’t?). So Wai, is just 32 kms before Mahabaleshwar and almost an hour's drive from Mahabaleshwar. A bit of an introduction first and then we’ll proceed to the further details of Wai. 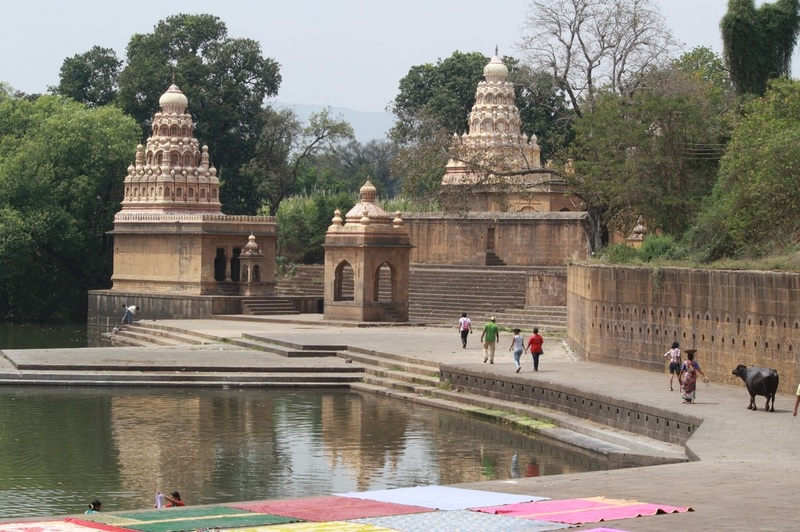 Wai is a small town in the Satara district of Maharashtra situated on the banks of Krishna River and is surrounded by the stunted Sahyadri range. Wai is known to most Mumbaikars for its ghats on the banks of the Krishna River and the famous Dholya Ganapati temple. Wai is also very famous in the film industry. Movies like Swades, Singham, Chennai Express, Ishqiya, Omkara have scenes which have been shot in Wai. · Satara: 35 kms (Approximately an hour's drive because of the ghat sections through which one has to drive to reach Wai. You can also book buses which ply daily, originating from Borivali. A comfortable 6-7 hours journey but do check your source of booking properly as general buses aren’t as comfortable to travel compared to the AC Volvo buses. If you want your mom to recognize you after the trip, then I would not advise you to visit Wai in the summer. The day temperatures are over the roof but the nights are pleasant. Monsoons can be fun too but the risk of the river overflowing is always going to be there. So the best time for anyone to visit Wai is of course during the winter. If you are looking for an adventurous experience during your visit to Wai, then I would strongly recommend you book your tents in Krishna River Camp. 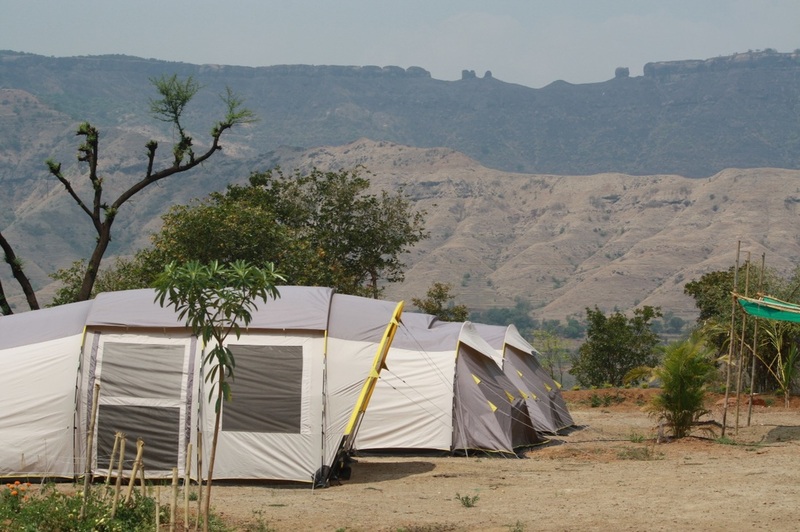 This camp is literally located on the banks of the Krishna River with comfortable and well ventilated tents. Although the flies are a bit annoying and the sight of an occasional golden cobra near the river will keep you alarmed during your stay in the camp, I can guarantee that this is the perfect place for an offbeat experience. The camp organisers will have a packed, fun filled schedule consisting of various activities such as trekking, swimming in the river (Trust me, this is something you don’t want to miss, and if you are planning to visit Wai in summer, then it would be tough for others to bring you out of the water. ), local sightseeing, stargazing, setting up campfires and so on. Oh, the food. Can anything be better than Barbequed chicken and Paneer with a campfire to keep you warm in the night? The delicious, rustic Maharshtrian food is what I would recommend everyone to try out in Wai. For people who don’t want to stay in a rustic camp, there are other small, affordable resorts and hotels inside the town too. Again, my sincere apologies for writing after almost seven months but now that I’m completely jobless for the next three and a half months, do stay tuned for articles exploring more awesome destinations in our country. As we approached the docks to board a boat which would ferry us to the Venetian mainland, a feeling of anticipation hung in the air. 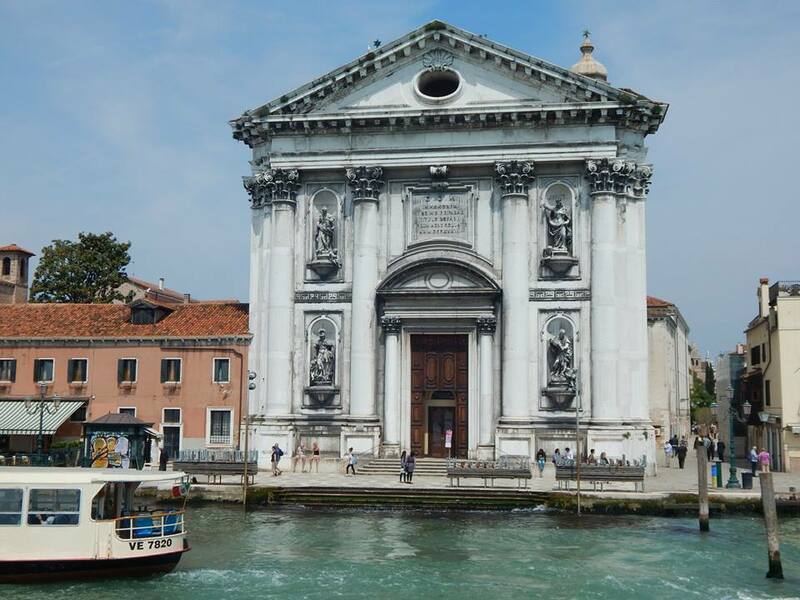 The itinerary of any prospective tourist who has made it his mission to explore the continent of Europe is definitely incomplete without a trip to Venice. Venice’s uniqueness is defined by its abundance of small canals with buildings encroaching on each side; the charming, historic essence of the city further highlighted by quaint old bridges passing over the narrow canals adorned with breath taking renaissance sculptures and imagery. Our visit began at St. Mark’s square which is the tourist hub of the city and overlooks an imposing structure recognized all over the world for its artistic brilliance i.e. 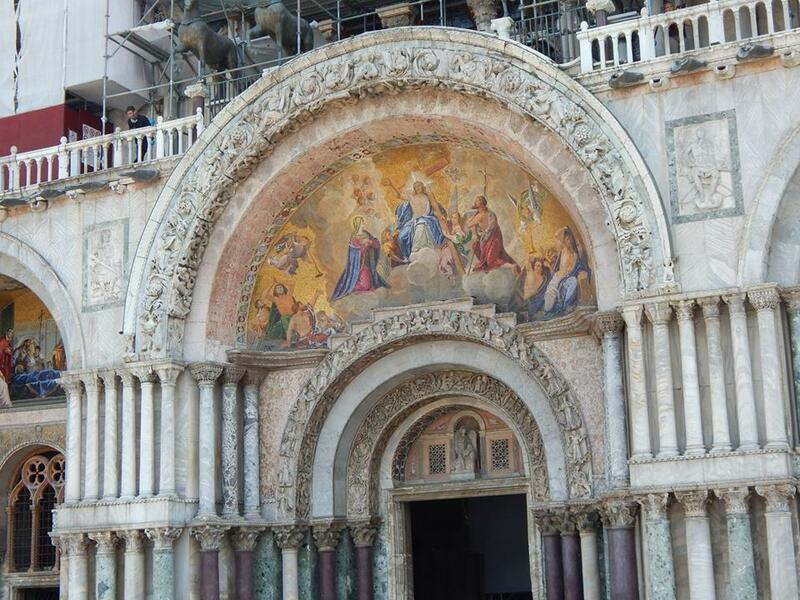 the St. Mark’s Basilica. Believe it or not, but the seemingly portrait like painting in the image above is in fact not a painting but is composed of a number of tiles; these paintings adorn every archway of the St. Mark’s Basilica, each one more exquisite than the other, leaving an art lover transfixed and absorbed in its mesmerizing beauty. The walk around the Basilica was perhaps the slowest of my life as we soaked in the vivid artwork on display, each turn revealing a new masterpiece, a new sculpture which left us bedazzled. The square itself was thronging with people from all over the globe, various shops were selling their fares at competitive rates, fares which might seem extremely common to a Venetian but left a tourist craving for a few more Euros in his wallet. The best bargain which caught my notice was gelato ice cream for a throwaway price of two euros which did not justify its rich taste and silky smooth texture. After lightening our wallets by a significant amount we left to indulge in a trademark experience offered by Venice i.e. a gondola ride. The entrance to the canal was extremely crowded with people haggling over prices with the gondola drivers. The gondolas resembled long sleek luxury paddleboats, with seats in the form of cushioned sofas. They had an air of history and elegance about them which made tourists flock to them like bees flocked to a beehive. As our gondola passed through the various canals of Venice we were transfixed by the architectural masterpieces on each side of us. A particularly charming image which comes to my mind when I recall our gondola ride is a charming café located on the banks of a canal which required one to tip-toe on a plank in order to enter, the idea seemed amusing and yet exciting and one which I wish I could’ve tried had I been able to spend a few more days in this beautiful city. 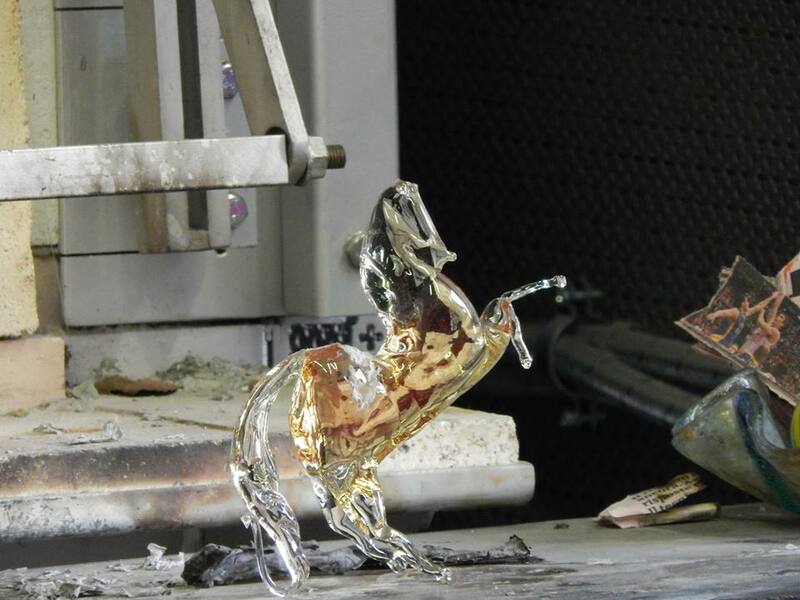 After exploring the canals of Venice we stopped at the Murano glassworks outlet where we saw a fascinating demonstration of how intricate glassworks were created from a mere lump of glass. The skill and daring of the artist as he thrust the glass lump into a flame of fire and then molded it using metal tongs left us awed and spellbound. We spent of the rest of the day wandering along the narrow alleyways of Venice and soaking in its contrasting beauty; a majestic palace adorned with breath taking renaissance architecture. As we stood in St. Mark’s square we soaked in the atmosphere, be it the majestic structures all around us or the quaint cafes playing music or the small shops selling clothing and memorabilia at ridiculously overpriced rates, it was an experience which we would never forget. We crossed the various bridges and reached the dock from where we boarded our boat back to the mainland. Our last look at Venice included the Clock Tower and the famous Doge’s Palace. We left Venice carrying with us a treasure trove of memories and strong desire to return again someday. Stay tuned as I explore more of Europe, till then sayonara and happy exploring! The highlight of my European tour was perhaps Mt. 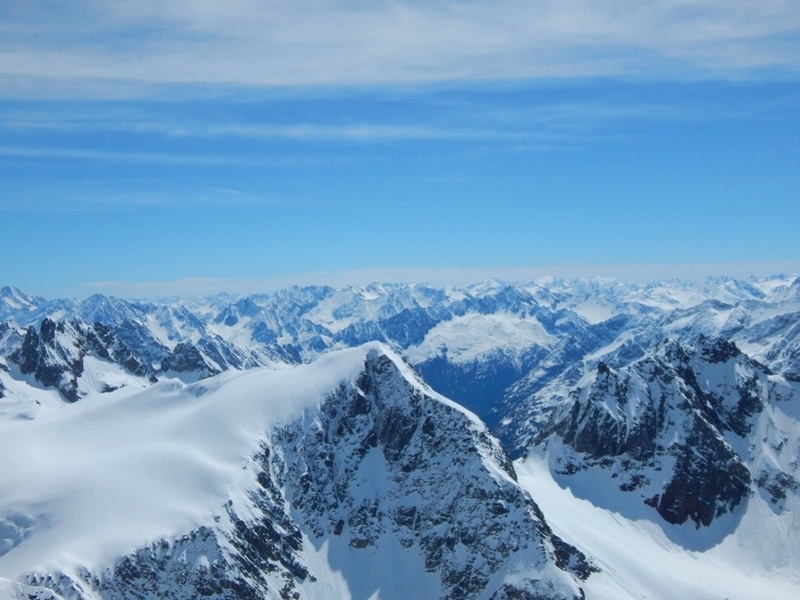 Titlis and the charming city of Engelberg. 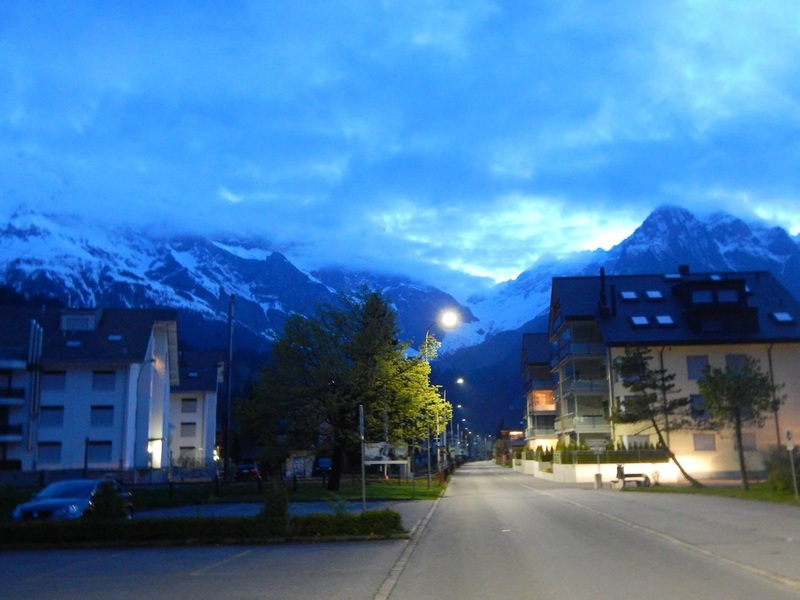 By the time we reached Engelberg, dusk had set in and lights were popping on all over the city. After checking in, we decided to take a walk and soak in the surreal beauty of the city. As we headed out, we noticed small lanes running in every direction - each of them offering panoramic views of the Alps. The buildings were mostly old and featured quintessential Swiss architecture. When I look back at my time in Engelberg, one scene particularly stands out - that of a small lane - flanked by residential houses on both sides - curving into the darkness and leading to the Swiss Alps; with its massive structure and sparkling white snow clearly visible in the fading sunlight. I’m sure a picture will help you envision the scene better. Walking to the town centre we spotted a beautiful fountain, its crystal clear water added to the scenery of the snowy Alps rising in the backdrop. If one stood at the heart of Engelberg and looked around, one would see snow covered majestic Alps rising in every direction. This town certainly made me think of paradise. The next day we began our ascent to Mt. Titlis. Our first cable car seated four people and was obviously made of glass to ensure that tourists could soak in the panoramic magical view that surrounded them. As we started moving it seemed as if we were on a roller coaster- albeit one which travelled at a dreadfully slow pace. 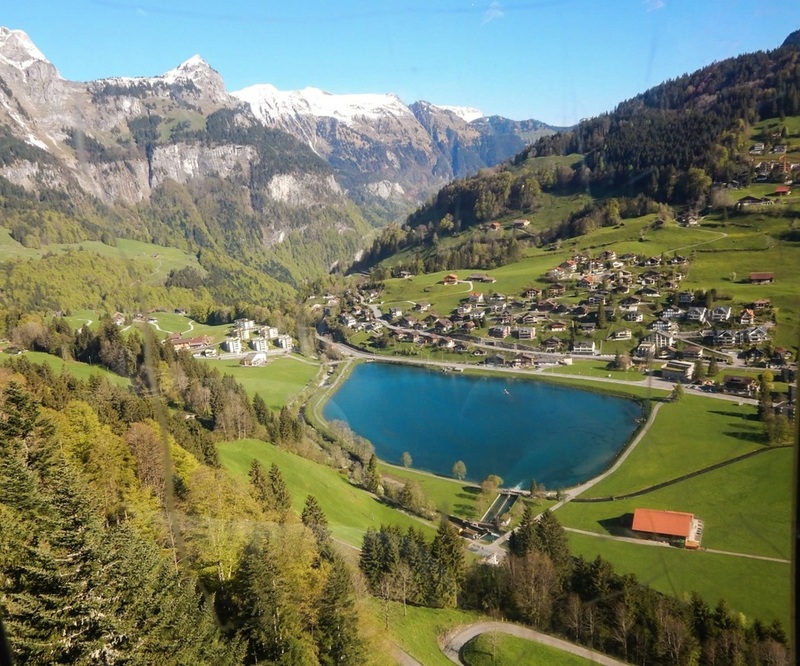 We were surrounded by Swiss Alps on all four sides and below us lay the beautiful city of Engelberg, with its small cottage like houses surrounding a sparkling blue lake. The feeling of rising higher towards the majestic snow covered Alps, as the town below became smaller and smaller is one which I shall treasure for a long time to come. We then boarded a revolving cable car, which is a popular tourist attraction. However, the cable car turned out to be a damp squib. Instead of soaking in 360 degrees views of the Alps, most of our time was spent looking at each other’s backs. However the few glimpses of the Alps that we caught certainly left us spellbound. On reaching Mt. Titlis the level of infrastructural development present there left me dumbstruck. The structure had five levels each leading to a different attraction, be it a coffee shop overlooking the glacier, or a specially designed walk where one could climb to the top of the glacier. The top itself was absolutely mesmerising. The experiences of holding snow in our hands, playing with it and even falling on it made this trip extremely special. After a short climb we reached the top of the glacier and on reaching there we were left agape for a while. Ahead of us stretched the Swiss Alps for mile after mile, their snow covered peaks glistening in the blazing sunlight. The sensation of standing there and being greeted by snow covered mountains on every side left us feeling dizzy. We then rode on the ‘Ice Flyer’, another popular tourist attraction. Basically it is a roller coaster that runs over the Alps range at intimidating speeds. The thrilling ride left us gasping and yet at the same time we fought to keep our eyes open, to soak in the mesmerising scenery that encompassed us. Later, we walked on a steel bridge that acted as a means of connection between two glaciers. As we looked down at the thick snow cover from the gently swaying bridge we definitely felt butterflies fluttering in our stomach. As we left Mt. Titlis we felt a mixture of sadness and happiness, however the memories of Switzerland’s snow covered peaks are those which I can never forget. I hope you enjoyed reading this article. Stay tuned as I explore Italy, France, UK and a lot more. Till then sayonara and happy exploring! As we entered Switzerland the first major landscape change which we noticed were the Swiss Alps covered in snow, transforming an ordinary drive into a breathtakingly beautiful one. As we drove towards the Rhine Falls, a feeling of anticipation hung in the air. Switzerland had of course been glorified countless times in various Bollywood movies and we were finally going to see if the myths about its beauty were indeed true. 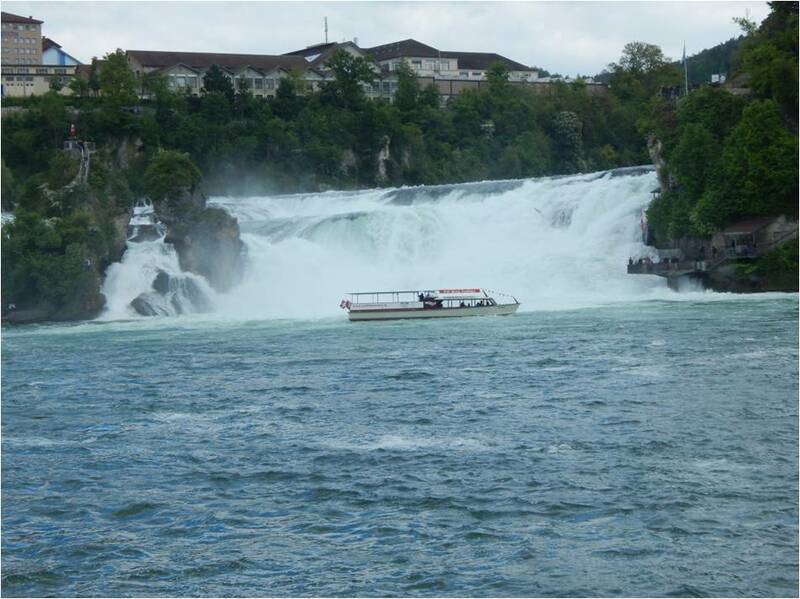 Rhine falls is the largest waterfall in Europe, and second largest in the world coming after the Niagara Falls in USA. 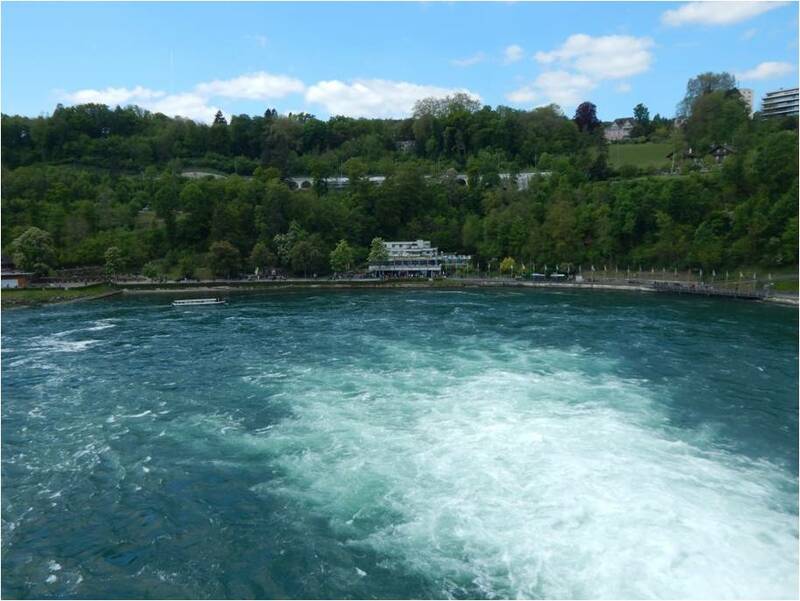 Our first sight of the Rhine Falls was one which certainly left us captivated. We stood on a jetty of sorts and watched as the water came crashing down with a force which seemed supernatural. Next, we got on a boat which took us to the heart of the falls. Here again there was a wooden platform with a series of steps going up to various levels where artificial viewing galleries had been created. Here again the infrastructural advancements of European countries to capitalise on the tourism industry left us spellbound. As we went up the first flight of stairs, we arrived at a viewing gallery which placed us horizontally in front of the waterfall. The gallery also offered scenic views of the lake which met with the waterfall and of the various settlements on the other side. We could hear the thundering roar of the water as it gushed down with immense force as the cool spray from the waterfall washed over us. We then climbed the second flight of stairs which led us to a viewing gallery located exactly on top of the waterfall, where one got the feeling that he was hovering over the falls itself. We watched as the water gushed towards the end and cascaded down with shattering force, creating a mystical combination of colors. 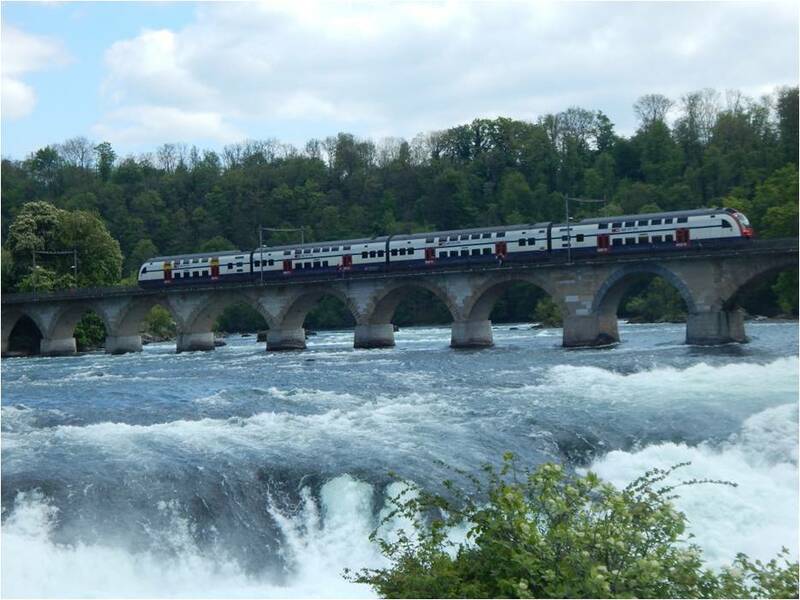 As we stood there we noticed an old quaint stone bridge passing over the falls and suddenly a train zoomed past on the bridge; it left us wondering about the beautiful view the passengers in the train would be enjoying. As we stood there watching the water crash down, we were transported into a different world altogether… However our dream soon ended as we had to descend in order to catch our boat back to the main jetty. However, on reaching the main jetty we met with another surprise. 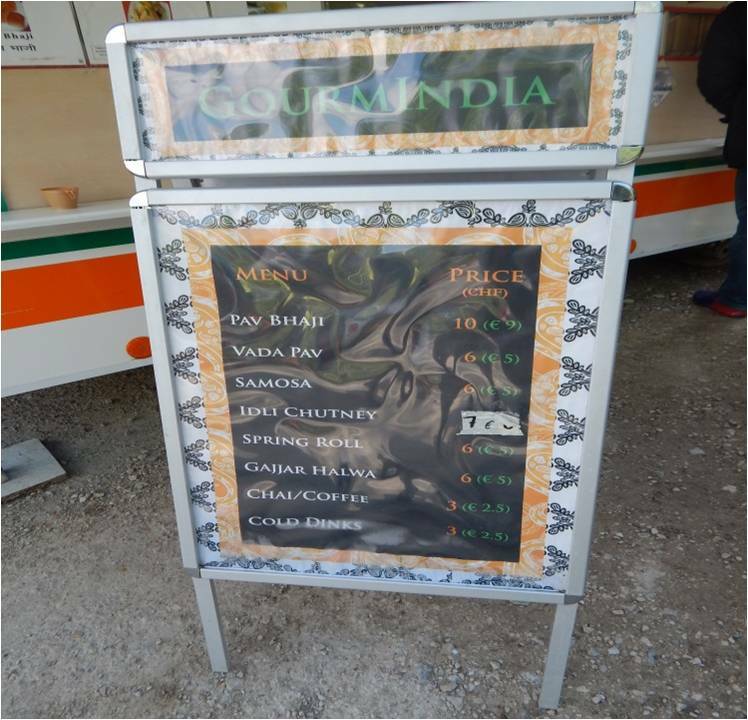 There was a tiny stall selling all kinds of Indian street food possible from vadapav to idlisambar. The masala chai seemed to be a favorite as orders for it kept flowing. The salesman attracted the crowds by shouting ‘Garamagaram chai sirf do rupai me!’ at the top of his voice. What he meant of course was two euros, of course, however the desi touch certainly had people flocking at his stall. For a moment I felt amazed and proud, especially as I noticed a number of foreigners trying vadapav and samosa with great enthusiasm. After treating our taste buds to some steaming hot, extremely overpriced desi chai, we left Rhine Falls with images that would be stored in our memory forever. Stay tuned as I explore more of Switzerland, Italy, France and a lot more. Till then; Sayonara and keep exploring!